A masterpiece of your rawfood kitchen! Absolutely delicious and stunning when you have friends, party or just want to impress your parents! Prepare three mini springform pans (diameter: 10 cm). Process the hazelnuts (we used a high speed blender, pulse function) until you get coarse crumbs and set aside. Finely chop the figs, then process them (we used a high speed blender, low speed, using a tamper) until you get a gooey mixture. Knead by hand processed hazelnuts and figs until you get a non-sticky dough, then press the mixture evenly in the three tins. Finely chop 30g of cocoa butter and gently melt it over a bain-marie, using warm water and stirring continuously. Throw all ingredients (2 riped persimmons, 1 tsp baobab powder, vanilla and cinnamon) into the high speed blender jar and blend until smooth. Divide the cream equally, pour it into two tins and smooth out using a wet spatula or spoon. Finely chop 30g of cocoa butter and gently melt it over a bain-marie, using warm water and stirring continuously. Throw all ingredients (2 persimmons, 1 heaped tbsp cocoa powder, 1 tbsp yacon syrup, 1 tsp baobab powder, vanilla and cinnamon) into the high speed blender jar and blend until smooth. Pour the cream into the remaining tin and smooth out using a wet spatula or spoon. Let the three tiny cakes rest in the fridge overnight. Throw all ingredients (almonds, 1 tsp baobab powder, coconut flour, agave syrup, 200ml water) into the high speed blender jar. Blend (at full speed, using the tamper) until you get smooth, fluffy and velvety whipped cream, which firmly holds its shape when dolloped. Let it rest in the fridge overnight. Assemble the layer cake. Remove the three tiny cakes from the pans. Spread some almond cream on a persimmon mini cake, then put the chocolate mini cake onto it. Spread some almond cream also on the chocolate layer and eventually put the second persimmon mini cake onto it. 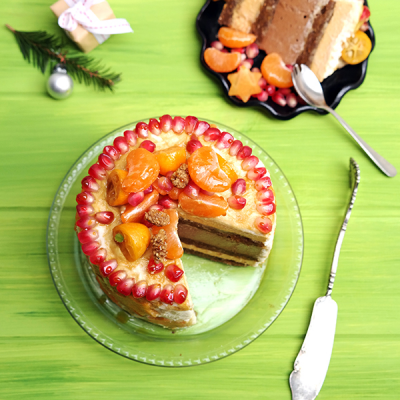 Frost the cake with almond cream and garnish with persimmon stars, tangerine slices, kumquat halves, pomegranate seeds and dried mulberries. Drizzle some yacon syrup over the cake to finish off. This recipe was created in cooperation with Stefania from the wonderful food blog La Tortoise.